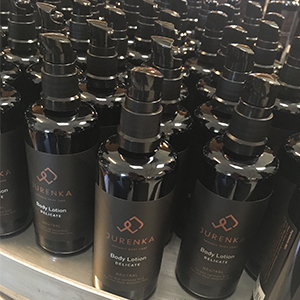 JURENKA Organic Body Care is totally newstarted - we began developing products in 2016, the first production ran in May 2017 and we are so excited about how the market will welcome us. Organic ingredients that works and sustainability is our main priority , which is why we are so happy about the fact that our products are processed locally at the plant of our sparring partner, who has been indispensable during the developing process. Another benefit is that the products are produced in small batches – in this way we ensure delivery of only fresh products. Nonetheless the durability is always min. 12 months in an unopened packaging, and totally without any chemicals! All our ingredients are ECOCERT-certified and most of them with the organic key. We wanted to be completely uncompromising which is why all ingredients are certified, and we are proud of being one of the few corporations on the market that have maximum possible content of organic ingredients and 100% natural and ECOCERT-certified content. As an ECOCERT-certified producer also the packaging is checked in order to ensure that no harmful materials are used. We have chosen the beautiful and elegant Miron glas as the continuous packaging in our product line. Glas is one of the most natural packaging materials, it is recyclable and furthermore the dark-purple Miron glas has the remarkable effect to prolong the durability with months, since light can not permeate and damage the natural products. I was completely baffled when I in November 2014 got the diagnosis breast cancer - and moreover quite a big one. As an adult I realised that many of my grandmothers values must have ment a lot during my growing up. 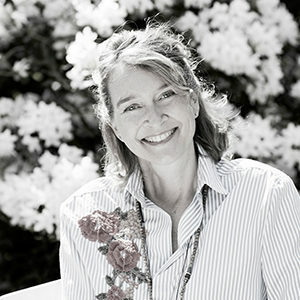 She invited me into her organic and natural universe, and she inspired me to study for Naturopath as an adult. Without thinking about it I have walked in her footsteps with the same values for organic and proper products, the diet has my whole adult life been essential in the perspective of health and wellbeing. I have never smoked, I drink moderately, which is why I was totally uncomprehending when I in November 2014 got the diagnosis breast cancer – and moreover quite a big one. 2015 passed with the treatment process chemo – 2 kinds, operation, radiation – 25 times, antibody injections – 17 times. Simultaneously with the treatment I ran my own supplementing approach – I became vegan from day one, I slowjuice every day and much more, but that is a completely other story :-). Already after the very first chemo treatments my skin changed increasingly. I tried a countless amount of creams and lotions, I researched, but nothing helped. I also discovered that you are actually allowed to call a product organic even with the smallest amount of organic content and that there often are used ingredients that I would not consider to use on my body. This is when I decided to start up my own production of an organic and natural skin care line suitable especially for the skin of people who have experienced cancer. In memory of my grandmother I have chosen to call my corporation by the name of her maiden name – Jurenka. There are 3 key words in our mantra: Ecology - sustainability - live. Conscientious, honest and happy – that’s us! 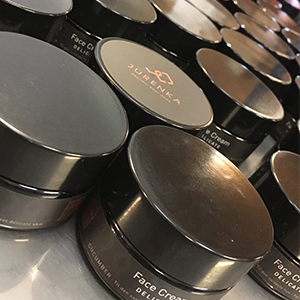 We want to make a difference and be firstmovers in producing organic and naturally processed skin care products aimed for people who have been in cancer treatment and are bothered by a sensitive skin. We want to grow wisely and hold on to our high content of organic ingredients in all of our products. We will seek the most sustainable subsuppliers, who meet our requirements to a natural and fair (i.e. fair trade) production.